Ryan Freshwater scored a hat-trick to send Winslow United into the top eight of the Spartan South Midlands League division one last night. Freshwater headed in Simon King’s right wing free kick to put United ahead after just four minutes. Eight minutes later Harry Dalton won the ball on the byline before cutting back in field. His low cross saw Matt Cruse get across the first defender to glance his header into the far corner. The home side attacked again and from another set play a petulant kick off the ball saw the referee spot it and award a penalty. Freshwater stepped up to net his second of the night on 24 minutes. 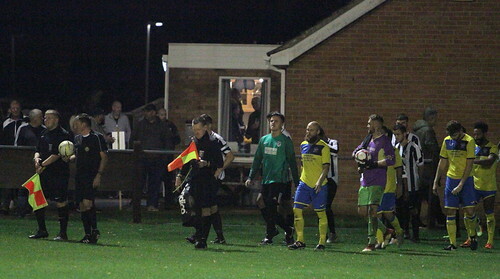 Amersham pulled a goal back when they caught Winslow trying to play out from the back and capitalised. In the 72nd minute Freshwater was hauled down as he attempted to attack a corner and he calmly stepped up to convert the resultant penalty and completed his hat-trick with Winslow’s fourth of the night. Late on substitute Tom Brindley latched on to a through ball. He went around the goalkeeper, before passing the ball over the line, despite the efforts of a visiting defender who slid into the net in trying to stop it. Amersham scored again, thanks to some sloppy defending, but it was United who took maximum points and head up the table.